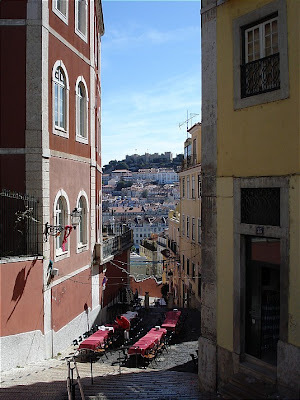 Lisbon and the Sunny Coast: Hills... and more hills! great and colorful capture of the hill. Thanks for your comments about the Frank Lloyd Wright Series on my site. I only have a couple more days and will show Wright's personal living quarters but will break tomorrow for theme day. I am going to look at your balcony photos on your nature site now. I will get our travel website up in the next week or two and post some amazing photos we took in Morocco. I ended up with some excellent people and culture photos from Morocco. It was a wonderful place to go as you predicted. JM, we have a water color painting in our house of one of the gates to St. George's Castle, which we bought from an artist who was at the castle where there is an overlook of the whole city. Lisbon's 7 hills are certainly taller than Rome's 7 hills. That is a stunning shot JM! I like the color in those buildings and those tables down there in between them. Looks like a great place to enjoy a meal! What a beautiful spot. Are those tables set up down there? A perfectly charming place to dine. There are so many things to see in this delightful photograph! And it's crisp and colorful. It appears a party was being planned down below. Were you invited? I would love to visit...one day, xv. Yes, one of the things you will remeber for Lisbon is walking up and down steep hills and stairs! But it's so nice! Oh! It is lovely! So wonderful capture! Amazing view! And I also like colours of the buildings! Thanks a lot! So many colors! I really like the narrow view of the hill. This is a beautiful photograph and the scene is just flat out pretty. I suppose those tables are for guests. Nice framing, JM. I see two perspectives which make the photo interesting. Like Rome... Wonderful view down! What a wonderful view. Lovely post. This is a stunning shot. I like the way you framed this with the buildings in the foreground. Lovely photo. I can't wait to go to Portugal, and take a walk around the little rúas. Makes we wonder, why do cities have seven hills .. not 5, not 10. It always seems to be seven. Love the shot but cities are such a crowded space.